Sites We Like < The Future of Doggie Advertising? The Future of Doggie Advertising? This is a fun idea: how about a dog food commercial that is specially designed with images and sounds for you rdog to enjoy too! Our dogs are such avid TV watchers that we often leave the TV on for them when we go out, and we’ve had them go into the other room if we’re watching a suspensful action movie, so it makes sense that advertisers would tap into this interest to make a commercial more compelling. 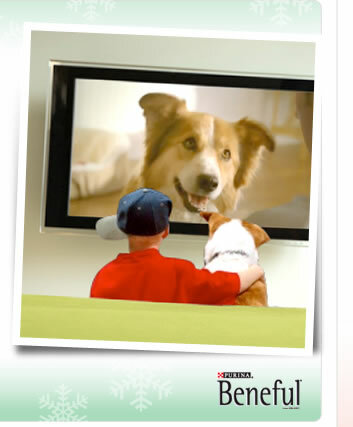 This particular commercial is for Beneful dog food from Purina, our amazing sponsor. You can watch a two and a half minute behind-the-scenes video here with the vet who developed the toy squeaks and high-pitched dog-only sounds, and then click the link under that to watch the TV commercial yourself — and with your dog too of course! Does it get your dog’s attention? Let us know by posting your comment on our Facebook wall!